Hey crafty friends! 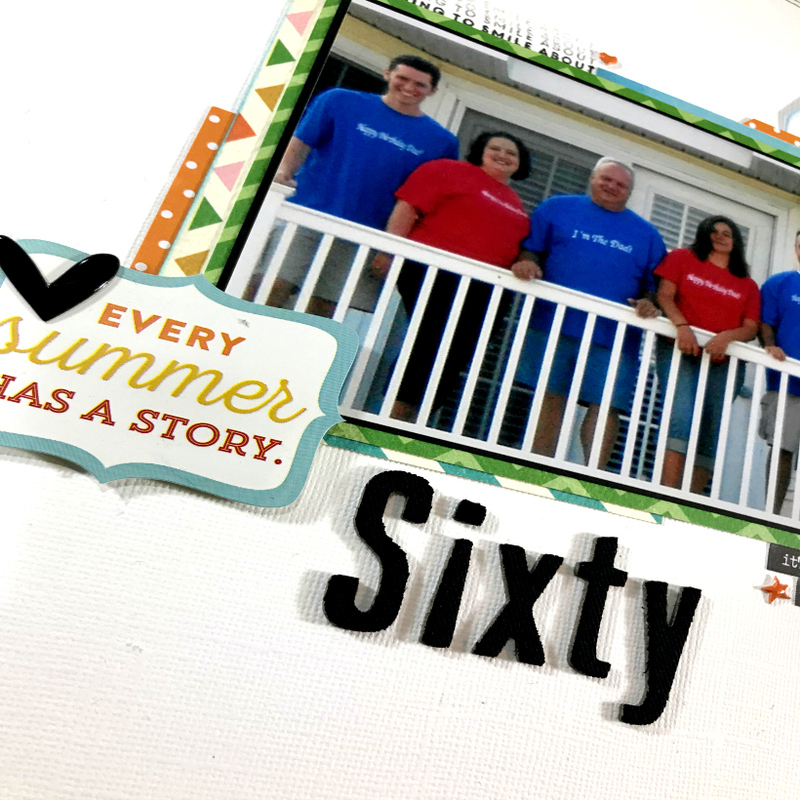 I’m back with you today sharing the Sixtieth Birthday Family Layout for two challenges. I used the bingo challenge from Redefined Kreative as well as the ocean theme from Challenge YOUrself. For the bingo challenge you had three rows you could choose from. All of them had things in common, but some had more challenging items like texture paste or wood veneer. 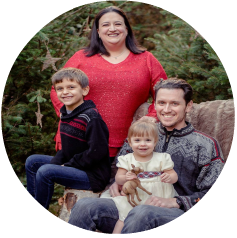 I choose the line with stickers, stamps, acrylic pieces, patterned paper, and ribbon. This close up shows me as part of the requirement for Challenge YOUrself. I am second from the left between my husband and my father. This photo was taken when we all went to the beach for Dad’s 60th birthday. My mom got everyone shirts that said Happy Birthday Dad, and then Dad’s said…I’m the dad. We all wore them out to dinner and gave everyone good laughs. We’ve also worn them for many years since. Dad actually turned 70 less than two weeks ago…tells you how old this photo is! In the above photo you can see the stamping at the very top of the strip next to the acrylic piece. I also have a touch of stamping above my photo. The every summer has a story is a sticker. I took the sticky up and popped it up on craft foam. I reach for my craft foam much more than pop dots anymore due to cost and easy of use. I find it so much easier to cut a piece of foam and glue on than place a million pop dots and remove all their backings. Last but not least is the ribbon I used through my tag. I still have to add my journalling, but otherwise I’m please with how this came out. I’m also glad to have this photo documented after way to long. I’m been working on going back to some of my older printed photos and have done a good job making a dent. What are you working on lately? Until next time…stay crafty. My Mom’s birthday is June 24th, but with Dad’s on July 4th and Faith’s on July 3rd we did one large get together this year. As the cost of cards has gotten ridiculous (the new Hallmark line is $7 – $12!) I’ve taken to trying to use my supplies and make my own. Mom’s favorite color is red, but I didn’t have any accent paper that didn’t come out looking like a red, white and blue 4th of July card. I decided to use the color she wears most of the time…navy. I used Bazzil cardstock for the Navy and Cream. The stamp is Triple Treat Flower by Stampin’ Up. 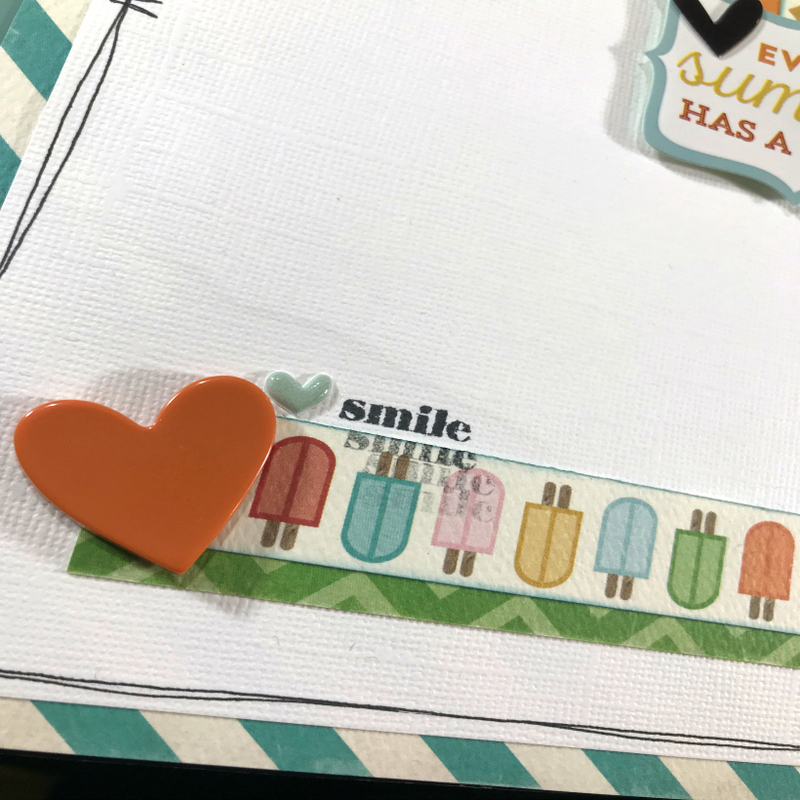 I also used the matching Stampin’ Up punches, but gosh if I remember their names now. The ink color is Brilliant Blue. I really like how it came out. It’s pretty, but not over frilly if that makes any sense at all. Oh, I also did a top fold card just for something different. I really need to find some more of the blue ribbon. I think I’ve used in in three projects lately. It’s actually not crafting ribbon, but was wrapped around a blanket that my friend Anita gave M when he was born. Funny – it’s my favorite ribbon and the blanket is M’s favorite too. Have you been making your cards due to the increased prices?